What Are the Sicknesses & Diseases Squirrels Can Get? Squirrels are rather ubiquitous creates in parks and woods. Like all animals, squirrels are vulnerable to disease. Viral and bacterial pathogens in their habitat can induce disease, sometimes fatally. Squirrels in captivity may enjoy the benefit of veterinary care, but those in the wild are left to fend for themselves. Squirrels that develop metabolic bone disease are suffering from a poor diet, especially a deficiency of Vitamin D or a lack of light. MBD is common in captive squirrels that aren't receiving sufficient natural light. It can be offset by providing the animals with at least 20 minutes of direct sunlight per day or, if that's not feasible, using full-spectrum light bulbs. Symptoms include lethargy and pain. Squirrel pox, also known as squirrel fibroma, causes the growth of tumors on the squirrel's epidermis. It's transmitted virally, usually by mosquitoes or from squirrel to squirrel. Young squirrels are most vulnerable. The tumors may metastasize into more serious tumors affecting the internal organs. There is no known cure for squirrel pox. 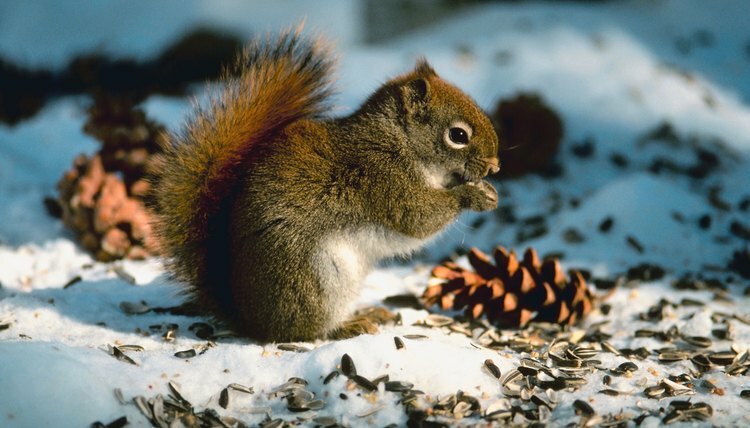 Squirrels are susceptible to a number of parasite-borne illnesses. These include baylisascaris (a type of roundworm), hookworms (which can cause anemia), coccidiosis (a parasitic illness that affects the small and large intestine and causes internal bleeding) and giardia (another intestinal parasite usually transferred by contaminated feces). Encephalomyocarditis is another viral illness. It causes inflammation and degeneration of skeletal and heart tissue and destroys the squirrel's nervous system. The disease is usually spread by contact with infected rodents or by secondary bacterial transmission. Symptoms include elevated heart rate, respiratory problems, blisters, physical pain and a lack of motor function. Infected squirrels are treated with antibiotics in the case of secondary bacterial infection.